When it comes to buying bedsheets, sometimes spending a little extra pays off. You spend a third of your life in them, so if it’s in your budget it really can be worthwhile to invest. But when spending money, it’s even more>important to get exactly what you want. Here’s a comprehensive guide to two of the most popular items on the luxe bedsheet market: Egyptian cotton and Sateen. Egyptian cotton comes from a specific cotton plant: the gossypium barbadense, to be exact. Egyptian cotton bedsheets have a matte look and a crisp feel. They can initially seem rough on the skin, but soften up with wear and after some washes. It’s the most popular luxury bedsheet choice, but comes with a similarly luxurious price tag, often as much as $500. Sateen is actually also made from cotton fibers, which are combed or carded to make them longer. The difference between Sateen and cotton is because of these fibers’ treatment. In Sateen, the long cotton fibers are mercerized, meaning soaked in lye (sodium hydroxide) and then in an acid. This sort of “seals” the fibers, making them more durable and long lasting than untreated cotton. It also means the fibers used in Sateen take dye better. Mercerization also gives the fibers a smoother, more reflective surface. This process is what gives Sateen its signature sheen. Sateen is also made from a different weave than traditional cotton: the satin weave, although unlike satin, Sateen is made from treated cotton fibers instead of natural, satin filament. Up close, Sateen appears to have a diagonal weave effect. It aims to combine the soft, smooth, luxurious feel of satin with the strength and durability of cotton. 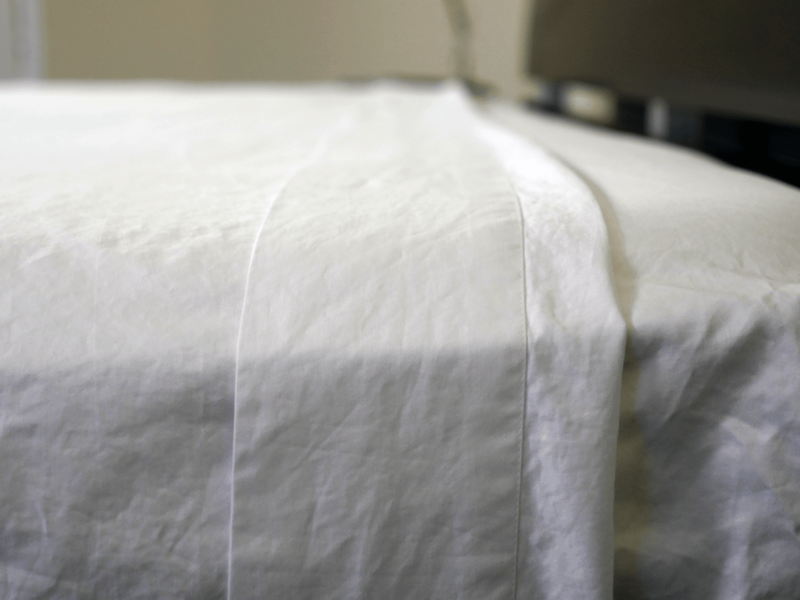 But buyer beware – there are a lot of “fake” Sateen sheets on the market. Instead of being mercerized, they are simply “calendared,” which means pressed or rolled to give the material a superficial surface sheen. This initial sheen fades after a few washes, and thus the sheets are left without any of the actual, practical benefits of mercerization. The differences between Egyptian cotton and Sateen primarily fall into two categories: differences of construction and differences of finish. Egyptian cotton is made from the untreated, long fibers of one specific cotton plant, and woven in a traditional one-over-one-under manner. Sateen is made from the mercerized fibers of any cotton plant, and woven in a satin weave, meaning multiple threads of the same direction dominate either surface. Egyptian cotton is matte, crisp, strong, long lasting, and often more expensive. Sateen is sheeny, drapey, smooth, more delicate, and often more affordable. Egyptian cotton is durable and long lasting (up to fifty years in some cases! ), which may justify its higher price tag. The fibers of the Egyptian cotton plant have very low levels of lint, and thus don’t pill, so it looks fresh and new for a very long time. 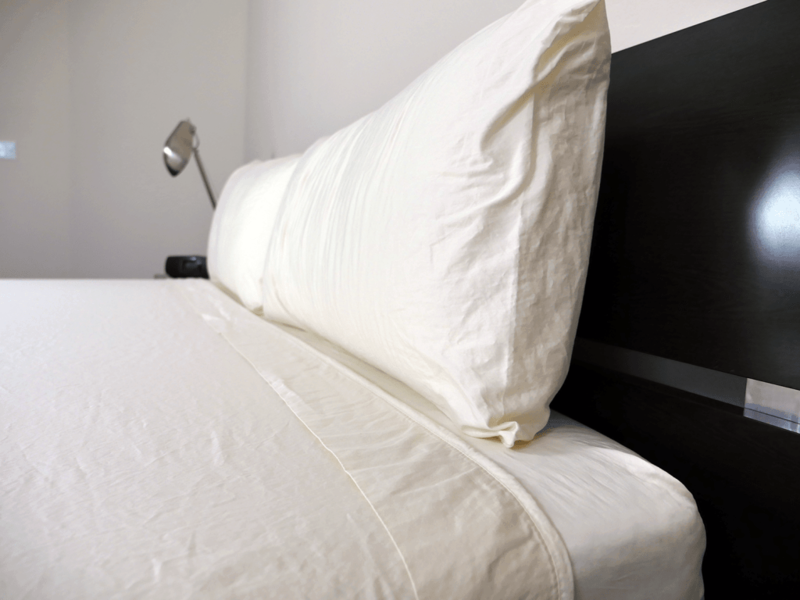 The high thread count means that the sheets are also very strong and unlikely to tear or become thin over time. Egyptian cotton is also visually appealing, as it takes dye well and doesn’t wrinkle easily. However, it’s much more matte than shiny Sateen, and doesn’t have the luxurious looking sheen or ability to drape. Both Egyptian cotton and Sateen are breathable, however Egyptian cotton is considered superior when it comes to temperature control. This is due both to its weave and its crispness, which means it drapes further away from the body. Sateen, because of the mercerization process, is water repellent and thus resists mildew. This makes it a good option for some people with skin sensitivity. Sateen sheets are attractive looking because of their signature sheeny finish, and drape very nicely. The mercerization treatment also helps dye take evenly and last a long time, meaning they look very vibrant and eye catching. A fresh set of Egyptian cotton bedsheets may not be particularly comfortable initially. They start life fairly stiff and coarse, becoming softer and more malleable over time and after some washes. Egyptian cotton can also be expensive. This can be justified by their lasting power, but still places them firmly outside of some people’s budget. Like Sateen, there are problems with mislabeling in the Egyptian cotton market. Many manufacturers will use a small amount of Egyptian cotton blended with other, less luxurious fibers, meaning you won’t get the true Egyptian cotton experience. Because of the satin weave used to product Sateen, there are multiple threads lying on top of the surface of the fabric, rather than just one at a time with cotton. This means it is much easier to pull or snag Sateen. 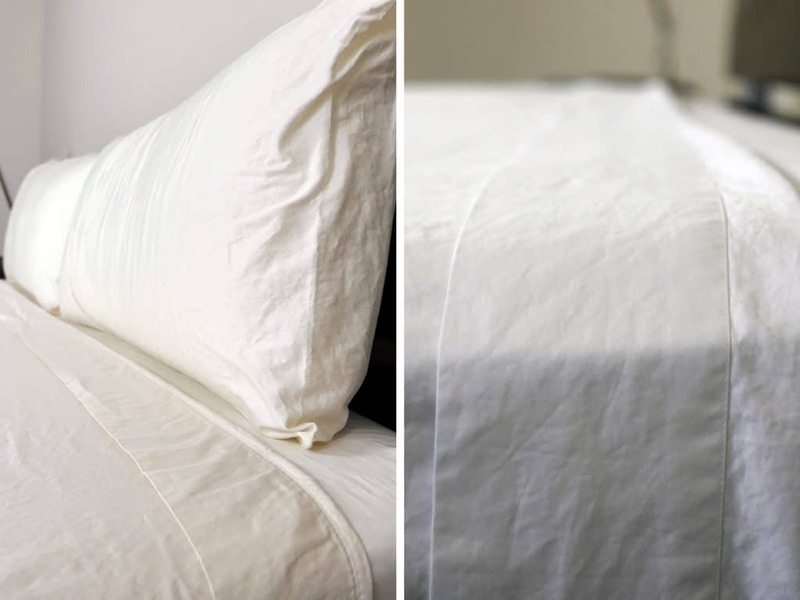 It can also make it more prone to pilling, which can make the sheets look worn and scruffy. They can wrinkle easily or even require ironing. Sateen is also slippy to the touch. This means it can have trouble gripping your duvet, which can end up falling around inside the cover, or bunching in a corner. Possibly the biggest drawback to Sateen, though, is its ability to retain heat. Because it’s lightweight, it typically drapes very closely to the body, which may trap heat and insulate it. This can be undesirable in the summer months or for those in hot climates. The choice between Sateen and Egyptian cotton really depends on personal circumstances, and what matters to you in terms of bedsheets. If you want something immediately smooth and soft, aesthetically pleasing, and available at a lower budget, Sateen may be good for you. However, if you want something very durable and comfortable in all temperatures, and don’t mind a matte finish, less attractive draping and spending a bit more money, you’re probably best springing for Egyptian cotton. You mix things up :) Sateen is just the weaving method :) cotton can be asian, american or egyptian .. It feels almost impossible to find the “right” sheets anymore. I have ancient sheets in my closet that are 60/40 cotton poly percale. They are still smooth and cool to the touch and never wrinkled after hundreds of washings. I would love to be able to get at least one set of sheets made the way these were. You can have 100% cotton!! Some sets pill to the point of being uncomfortable or feel like flannel. Most of them wrinkle, especially at the hemmed areas, so badly that even ironing can’t remove the mess. I did buy 1 set that said it was cotton/poly blend. I found that they were cotton on one side and poly on the other side – weird since it affected the color depending on which side was up. Would LOVE to find sheets that perform the way they did 40 years ago. The explanation and synopsis are great. Told me what I needed to know without wasting time. Thanks. Thank you for this very informative review of sheets! My question = I am a many years customer of JCP Sateen sheets, and they are advertised as “Sateen/Egyptian Cotton” sheets! Can they really be BOTH? The only thing I do not appreciate about them, is that they are too large for my “old fashioned”, regular sized mattress! (no ‘deep pockets’ needed), and require daily adjusting in the mid-section, due to slippage. Thank you for your helpful response! Thank you for posting this information. It has helped me in deciding which sheet to go for. Very informative and can’t thank you enough. This is a very informative and helpful article. Thank you.